The perfect wedding flower! So real looking that you can almost smell it. 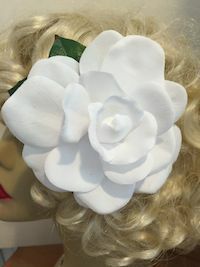 This gardenia is so soft and flexible, it's perfect to wear in any hairstyle. This gorgeous blossom has two leaves and measures about 4" and is attached to a non slip single prong clip. Wear multiple blossoms for an even more beautiful look! Choose leaves or no leaves.